Pay Attention to “An Echo of Murder” – Joyce's mystery and fiction book reviews with some non-fiction too! 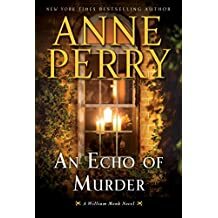 I have been reading books by Anne Perry since “The Cater Street Hangman,” so a new book in any Anne Perry series is something I look forward to. I found this book to be superb; truly one of her best. Old readers are rewarded with back story about Hester and her brother, as well as her friendship with a doctor with whom she served in the Crimean war. The story resonates both in its time and today, as many continue to fear and distrust anyone who is different. This novel can be read by readers new to the series as well as long term devotees. I was sad when I turned to the last page and will definitely be eagerly awaiting Anne Perry’s next novel! Thanks to NetGalley for allowing me to read and review this excellent book.